After two failed releases, this third one is third time lucky or bust. 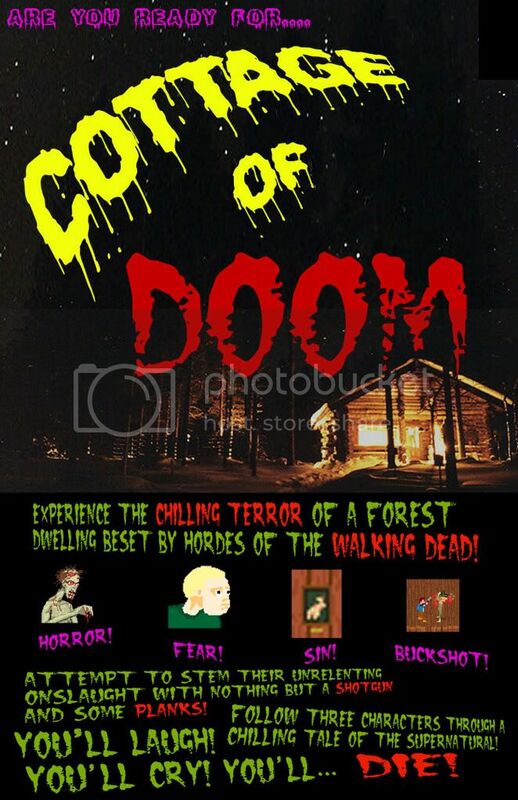 ENTER THE COTTAGE... OF DOOM! Re: Be afraid. Be... QUITE AFRAID! Yes. Zombies... and a cottage! Nice I like the look of the pixel art....what is this going to be about? It's actually the artist's game idea and I've appropriated it somewhat. Also the artist hasn't provided any art yet and may not do so at all, we'll have to see. You're in a cottage and you have to keep the doom from coming in by barricading the exits and defending them. 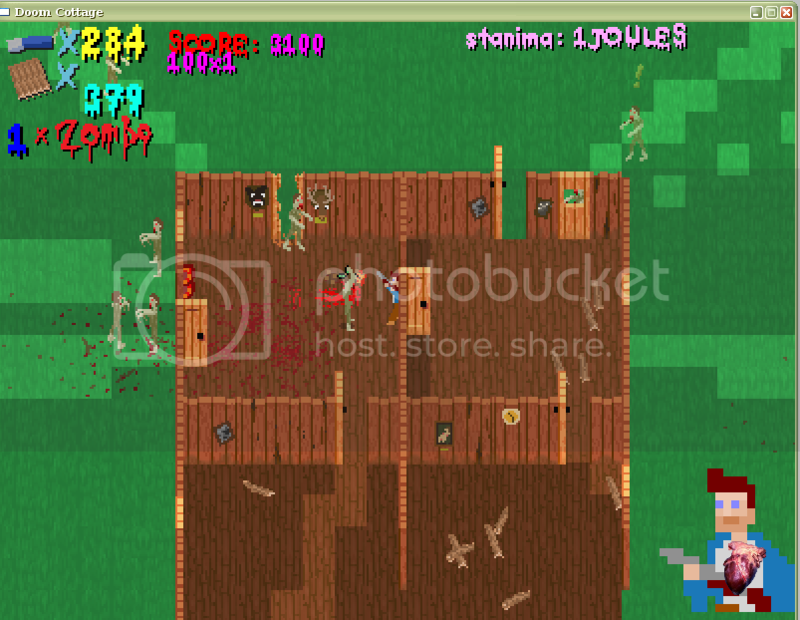 At the moment I'm thinking you have a choice - break the furniture up, in which case you can use the planks to fortify the exits, and the furniture contains ammo, or move the furniture for a proper blockade, but this sacrifices the ammo inside as once the undead get through you'll have to kill 'em before you can get to that ammo. Might work, it might not. My family and I made a home movie back in the day about our cottage, subtitled the cottage of doom. Realistic cottage action! I can't wait. Looks sweet. 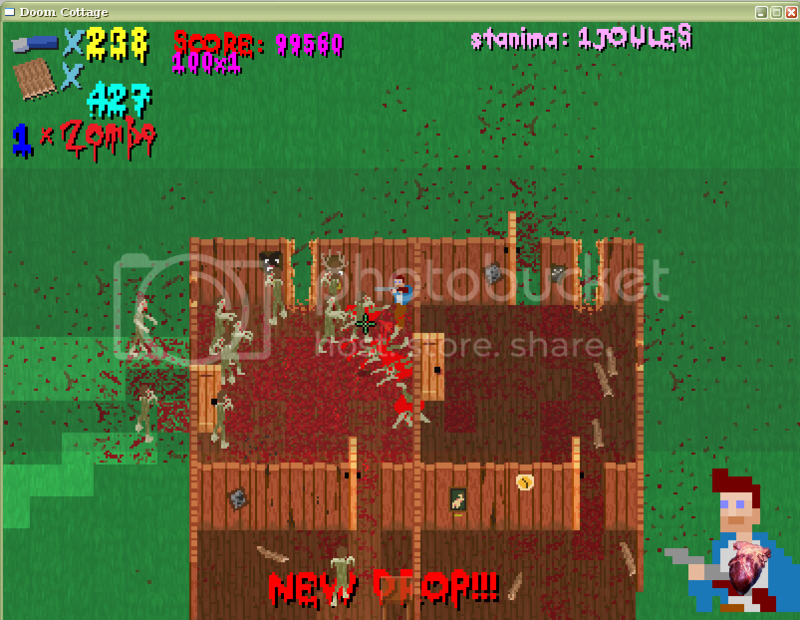 True story: Me and a few friends were planning a make a zombie parody game called C.O.T.T.A.G.E. (City of Totally Terrible and Gory Evil)a while ago. Seriously. Lookin' forward to this one. Excellent looking artwork you got there. I look forward to seeing how the game develops. Hooray for Photoshop outer glow! But, are the survivors inside the cottage naked? Will there be naked zombies? We just need to start a whole new competition where the only rule is that the game has to include a naked man. Drunken Naked Oliver Reed wasn't too hard to find, weirdly enough. Ask Xion for help, if your artist can't finish. You MUST enter the competition.